What do I do if my car is damaged in an accident? STEP 1 Lodge your claim through your insurance company to get the process started. STEP 2 Request Gino’s perform the repairs or Contact Gino's Panel & Paint directly with your claim number. STEP 3 Make an appointment to get the work done and sit back and relax! STEP 4 We will keep you updated live via SMS at every stage of the repair process. STEP 5 Repairs are complete! Gino’s Rapid Repair technology will have you back on the road faster. Can Gino’s Panel and Paint perform repair work for any insurance company? Gino's Panel and Paint work with most major insurance companies. Our panel beaters have taken care of the local community since 1973, and our quality smash repairs to accident damaged vehicles is acknowledged by our partner relationships with RAC, Allianz & Subaru.We are pre-authorised for most claims and can deal directly with your insurance company to progress your repair. We care about you and your car and we want you back on the road faster. Can I tell my insurance company where I want my vehicle repaired? Most insurers will offer a choice of approved repairer. If your insurer tells you that you must use a certain smash repair business, you can always ask for clarification and suggest your own choice. Always ask the question.Gino’s is an insurance approved repairer with most insurance companies, so it’s highly likely that we provide our car repair services to your insurer. Contact Gino's Panel & Paint and provide your claim number. We can sort it out with your insurer from there. Easy! Can I claim against the other party’s insurer? Proceeding through your own insurer is usually more convenient and time effective for you as your insurer is working directly with you and your repairer. In dealing with a third party, you may not have the same flexibility in choice of repairer and in having the repairs carried out in a timely fashion.Contact your insurer to be sure. Once you have a claim number, we can provide an estimate. Do I contact Gino's or my insurance company first? Contact your insurer and let them know your circumstances, and ask to use Gino's Panel & Paint as your repairer. Then contact us on 9432 8200 with your claim number.You can call RAC on 13 17 03 and Allianz on 13 10 13 to directly make a claim. Are car repairs covered by insurance? This will depend on what your car insurance policy covers. Basic car insurance usually covers the cost of repairs caused by a car accident but not general mechanical repairs. Gino’s Panel and Paint specialises in car accident repairs and we’re a preferred repairer for many insurance companies including RAC and Allianz. How long will the repairs take? The complexity of the repairs which can mean that some damage may not be fully visible until the vehicle is stripped. Parts availability, especially if they need to be sourced from interstate or overseas. Unexpected changes to workflow schedules due to factors beyond our control. Insurance claims need to be in order to proceed with repairs. Our clients are updated on repairs in real time via SMS, ensuring they know exactly when each stage has been completed and when the car is ready to be picked up. Our clients are kept informed of any changes as soon as possible to minimise any inconvenience. What is Gino’s Rapid Repair technology? Symach Flydry: These machines are the latest in body shop automation and allow us to dry any car body part quicker and with improved results. 1Q1 Body Shop Flow Management Software: The latest management system in our industry. It allows us to have complete control of the workflow and it helps us predict timings and costings so that you can get your car back sooner. 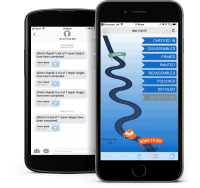 We also send real time progress updates to your phone so you’ll know when each stage is completed and exactly when to pick up your car.Read more about Rapid Repair. Does Gino’s Panel and Paint only provide panel beating services? Gino’s Panel and Paint provide a wide range of services as well as Smash Repairs. We also offer Car Scratch Repairs, Dent Removal, Car Detailing, Car Respraying, Bumper Repairs, Paint Protection and even Pre-Purchase Car Inspections.Our technicians care for our customers and provide them with the highest quality all round service - because we love what we do and take pride in getting it right first time.Please let us know if you would like us to quote on anything else while we have your car. Will you clean my car after repairs? Of course! We know that repairing your vehicle after a car accident is a stressful time, so we will give your car the TLC it deserves with a wash and vacuum before you take it home.To our specialist technicians, quality is the number one priority. Using our state of the art equipment, your car receives a flawless refinish in a clean environment, restoring your vehicle to pre-accident condition. What does a panel beater/spray painter do? Panel beaters and spray painters use specialised equipment and products to restore an accident damaged vehicle to look new.Panel beaters remove dents, carry out major and minor panel repairs and replacements, structural repairs/realignments and some mechanical/electrical repairs. Spray painters prepare new, old and repaired parts/surfaces, use sophisticated colour matching techniques and start of the art equipment and paint products for a perfect paint finish. What do I need to work as a panel beater/spray painter in Western Australia? To work as a panel beater/spray painter in Western Australia, you will need to complete an apprenticeship to achieve a certified trade qualification. You will then need to apply for a repairer licence: that is, a Motor Vehicle Repairer's (MVR) Certificate. You will need to supply a National Police Certificate with your application. If you don’t have an MVR, you must work under the supervision of someone who holds a current MVR certificate/licence. It is preferable and advantageous to have your own MVR. How long is a panel beating/spray painting apprenticeship? A panel beating/spray painting apprenticeship usually takes 3 and a half years (42 months) to complete. Does Gino’s offer panel beating/spray painting apprenticeships and how can I apply? Absolutely! We hold apprenticeship drives and have recently been named MTA WA’s Employer of the Year, which is a testament to our amazing workplace culture and dedication to recruitment and training.We care about our employees, our customers and our community at large. We enjoy what we do and we are passionate about doing a great job. If this sounds like you, we would love to hear from you! Visit the Gino’s Panel and Paint employment page for more information. You’re a member of Car Craft, what does that mean? Car Craft members are experts in the collision repair industry.They understand the need to provide high quality repairs in the shortest possible time and will manage the whole process with your insurer, as well as repairing your vehicle.Car Craft members are equipped with state of the art technology and have the experience, equipment and expertise to ensure you receive a quality repair using the correct method in a timely manner.All Car Craft members operate with fair and reasonable charges that reflect our investments in our processes, procedures and staff.All Car Craft members have been audited for compliance with the national Green Stamp Environmental Management System. Green Stamp is a motor industry specific program that provides accreditation for businesses that comply with all the requirements. What are your Quality Standards? We aim to carry out all our repairs to the highest standard and with the minimum of inconvenience to our clients.Our 1Q1 Bodyshop Flow Management System ensures we achieve that standard through continuous improvement practices, by delivering the highest possible quality in all our repair work and by observing industry best-practice in all our operations.Clients and insurers who use our services are secure in the knowledge that all our work is guaranteed. Do I get warranty or guarantee on the work carried out on my vehicle? Gino's offer 3 years warranty on labour & paint. The insurance companies/work providers offer a lifetime driver/policyholder warranty. The WA government provides more info on your rights in regards to motor vehicle repairs. Does choosing an independent repairer for my accident repairs mean I void my manufacturer warranty? Some dealers and manufacturers make broad statements that you will void your warranty or similar if you choose a repairer that is not part of the manufacturers network.The ACCC provides a Motor Vehicle Sales & Repairs Industry Guide which states that "any suggestion by car manufacturers or dealers that motor vehicles need to be serviced at a licensed dealer to maintain the owner's consumer guarantee rights is not correct. "Gino’s Panel and Paint only use genuine OEM (Original Equipment Manufacturer) parts. This means you can rest easy knowing your vehicle will be repaired to manufacturers’ specifications using only genuine parts. Does Gino’s Panel and Paint have a Motor Vehicle Repairer License? Consumer confidence in our ability to provide quality service and repairs is backed by the knowledge that our company and staff possess the required Motor Vehicle Repairer Business License (License Number MRB268) and the relevant individual Motor Vehicle Repairer Licenses. Are you really concerned about the environment? Yes we are. We have been proud to call the Fremantle area home since 1973. We have children and grandchildren and we want to leave the area and the earth in a fit state for them.Our commitment is reflected in the fact that in 2002, we were one of only two accident repairers among a group of the 10 Inaugural Automotive Businesses to earn the Motor Trades Association’s highly regarded Green Stamp accreditation, which we maintain today.Our environmental management plan ensures we manage environmental risks, collect and store waste products for recycling and safe disposal by licensed operators and we always look for ways to improve Gino's Panel & Paint environmental management practices, in accordance with the Green Stamp program and in partnership with Eco-Logical Australia and Eco-Friendly Symach. How can I find the exact paint colour to match my car? Gino’s Panel and Paint uses the latest technology from AkzoNobel Colorvation to ensure a seamless workflow when it comes to car paint colour matching.The Colorvation car paint colour match process means the team has greater accuracy and work more efficiently in the car paint colour matching process.By combining fully down-drafted pressurised cabins, our painting environment provides a dust free environment, perfect for refinishing vehicles. This system is one of the most environmentally friendly systems available. Do you provide full car respraying or just individual panels during repairs? We provide full car respraying and spraying of individual panels as part of insurance repairs.We have pressurised dust-free and environmentally friendly cabins, perfect for refinishing vehicles.We care about the quality and finish of your car paint repair work and our shortwave microwave technology allows us to ensure your car can be ready in the fastest possible time without compromising quality.Our Auto-Refinish Technicians can tell you more about our car paint repair and car spray paint options. AkzoNobel Colorvation is the newest digital technology in vehicle colour refinishing, which provides Gino’s Panel and Paint greater accuracy and greater efficiency in their car paint colour matching process. Gino’s has doubled its car paint matching accuracy already! Where’s a car repairer near me? If you live south of the river in Perth, Gino’s Panel and Paint is located nearby in South Fremantle at 228 Hampton Rd, South Fremantle. How do I get a smash repairs quote? Make sure you have your insurance claim number ready and go to our Get A Smash Repairs Estimate page to organise a time to bring your car in for an estimate.Please note: non-insurance quotes require a $100 quote fee. This fee is deducted from the cost of completed repairs. We accept EFT, credit cards (Visa & Mastercard) and cash. How can we contact Gino’s Panel and Paint outside of opening hours? We’re open 8.00am – 5.00pm Monday to Friday, however if you need to contact us after hours you can either email us on ginos@ginos.com.au or message us through our the Gino's Panel & Paint Facebook page. Our friendly chatbot can answer most of your questions or we will get back to you as soon as we can. Can I follow Gino’s Panel and Paint on Social Media? Yes please! We love having lots of friends and it means we can keep you up to date on all Gino’s Panel and Paint news, as well as giving you lots of interesting tips and information on the automotive industry. Follow Gino’s Panel & Paint on Facebook here. You can also get questions answered by our friendly chatbot by messaging us through Facebook! Where is Gino’s Panel and Paint located? Gino’s Panel and Paint workshop is located at 228 Hampton Road, South Fremantle. Can I negotiate car repair costs? Depending on the repair that is required we may be able to offer you options on how the repair is performed. At Gino’s, we understand that your time is important, and we can offer options to reduce the time without your car. Talk to us to discuss your car repair options. Why are car repairs so expensive? Scratch repairs and dent removal are generally cheaper than replacing an entire panel, but in some cases, this is required if the damage is severe enough or the safety of the panel has been compromised in the collision. What are the most common car repairs? What car repairs can I do myself? It’s strongly recommended that you get a quote from a professional to understand the required work before attempting anything yourself. Although it may be tempting to DIY and avoid paying an insurance excess, there may be issues that you can’t identify and require qualified repairs to ensure your car is safe to drive. Rapid Repair is an option offered by Gino’s Panel and Paint the reduces the time needed to repair your car. It uses state-of-the-art technology to reduce the repair time by up to 65%. Are Rapid Repairs covered by insurance? Most basic car insurance covers repairs needed as a result of an accident. Gino’s Panel and Paint are a preferred insurance repairer for both RAC and Allianz. Our rapid repair technology is used on most repairs and ensure that you are back on the road faster. Added to that we can provide you real-time updates on how your repair is progressing at every stage of the process. What is a smash repair? A smash repair is the work done to repair your car after an accident. This is usually performed by a qualified panel beater or car repairer. What are common smash repairs? Common car smash repairs are scratch repairs, dent removal, panel repair or replacement and car respraying. Are smash repairs covered by insurance? Most car insurance policies will cover the cost of any repairs needed as a result of an accident. Check with your car insurance provider before starting any repair work and quote your Insurance Claim number on the booking form. What is car scratch repair? Car scratch repair is the work done by a panel beater or car repair to remove or repair scratches to exterior panels of a car. This may require buffing, filing and painting the affected area. Gino’s take care to restore your paintwork to its former glory in record time. Using industry-leading technology, Gino’s car scratch repair and spray painting service provides professional results that cannot be achieved by car touch up paint. What is a car respray? Car respraying is the service done by panel beaters when they repaint an area of a car’s exterior panels to match the original colour. Car paint can be chipped, scratched or removed during an accident or from a car’s paint deteriorating. Resprays available for all models and makes. Our processes and highly specialised technicians ensure fast and reliable results. What is a common car respray? 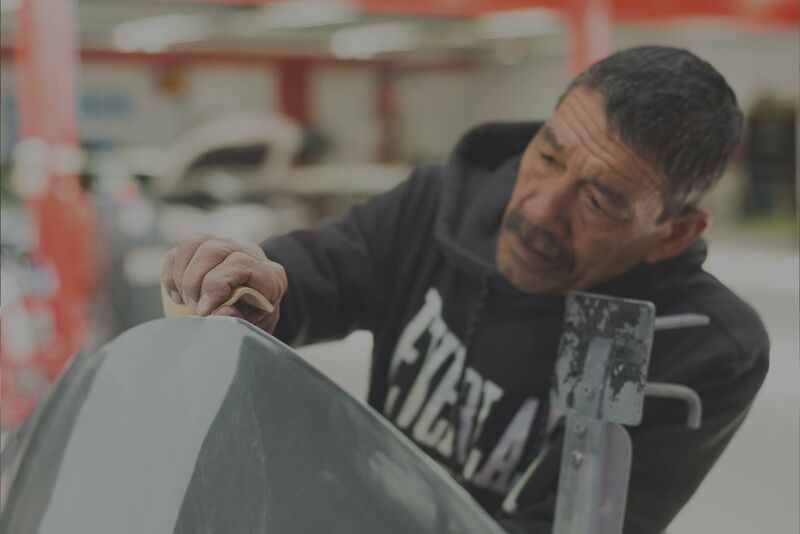 The most common car respraying work comes from car accidents where a car’s panel has been damaged and the paint has been removed from an impact. Car dent removal is the process performed by a panel beater to reshape a car’s exterior panels to their original form. This is usually required after a car accident. What is a common dent removal? The most common dent removal is from the front and rear bumpers of the car. These areas are most likely to incurred damage during a car accident. The lower panels of a car are also vulnerable to dents and damage. Panel beaters perform bumper repairs when a car’s front or rear bumper has been dented, damaged or scratched due to an accident. The most common bumper repairs are to the corners of the front and rear bumpers. These areas are most likely to incur damage during a car accident. Join our mailing list and stay up to date with interesting car stories and Gino’s news.